A perfect synergy of performance and style, the Street Rod pressure washer delivers the power you need to tackle any residential or commercial cleaning job. Putting the muscle behind the name is the proven strength of a GX390 engine from Honda and a triplex pump from Annovi-Reverberi. Engineered for comfort and stability thanks to the Anti-Vibration system (PAVS), the ergonomic design includes a premium welded roll cage frame and oversized wheels for great maneuverability. PowerPlay washers can handle any cleaning job from siding and windows to stripping paint or power washing vehicles. Plus, an innovative motorsports-inspired chassis design gives this pressure washer a muscle car cool factor! 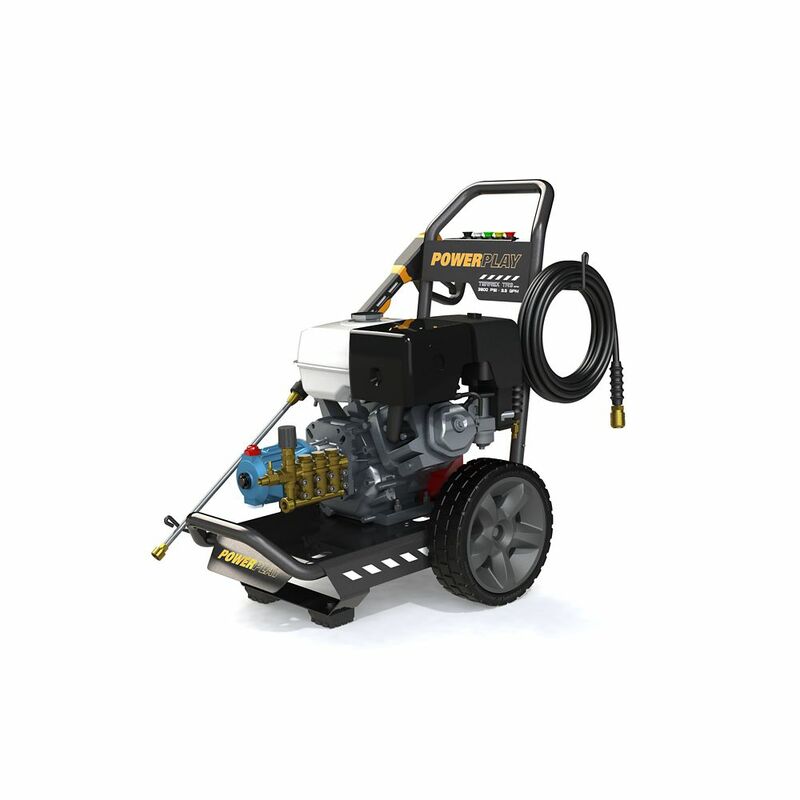 Terrex 4200 PSI 4.1 GPM Professional Gas Pressure Washer with Honda GX390 Engine A perfect synergy of performance and style, the Street Rod pressure washer delivers the power you need to tackle any residential or commercial cleaning job. Putting the muscle behind the name is the proven strength of a GX390 engine from Honda and a triplex pump from Annovi-Reverberi. Engineered for comfort and stability thanks to the Anti-Vibration system (PAVS), the ergonomic design includes a premium welded roll cage frame and oversized wheels for great maneuverability. PowerPlay washers can handle any cleaning job from siding and windows to stripping paint or power washing vehicles. Plus, an innovative motorsports-inspired chassis design gives this pressure washer a muscle car cool factor! Terrex 4200 PSI 4.1 GPM Professional Gas Pressure Washer with Honda GX390 Engine is rated 4.7 out of 5 by 6. Rated 4 out of 5 by SilFace from Great machine though come with cheap hose! Purchased the Terrex 4200 PSI over a month ago. Was shipped to HD store, great service! Machine is great, though hose is really cheap, it was replaced! Love the wheels & metal frame! The pump can probably supply 4200 PSI, though motor can only supply 3500 PSI. This was measured when a pressure gauge was installed to machine; A useful item to add to machine! Rated 5 out of 5 by BGBVCBC from Excellent I have had electric pressure washers before but this is the first gas model I bought. I have used it several times and I am very pleased. It is made with top quality components (the Honda engine is great and the AR pump is great) on a very solid and compact frame. It is very well designed, with a small footprint for storage. The handle removes easily making it very low height for storage as well. I was a bit concerned about the run-flat hard tires, but they work great also. It is a very heavy unit, but it rolls around easily, even through the crushed rocks on one side of our house. I am not sure what the ‘anti-vibration’ system is, but it seems to work. The engine runs very smoothly, the machine does not vibrate much, and the unit does not “walk around” or move at all when in use (as others have complained about gas pressure washers). You can get the same engine and pump on other brands for a bit less money, but I bought this one because I like the compact frame which takes up less space for storage. It is very compact. A minor point, but I could not get the detergent dispenser to work as instructed. It worked fine with the machine shut off, just running the garden hose pressure through it. Lots of detergent came through. But with the machine running and using the detergent spray tip as instructed, no detergent at all would come through. I generally do not use detergent anyway (I have never been able to tell it helps - seems a waste of time to me) but if I do, will have to apply it first before starting the machine. I sent a question in to Powerplay Customer Service from their website almost a month ago and never got a response. So, based on my limited one-time attempt at customer service from the manufacturer, it seems it does not exist. But it is such a great machine I am not worried about it. I bought it through a big box store online, but it was shipped directly from the manufacturer to my home. Shipped almost immediately, came on a wooden pallet, upright in it’s box, and in mint condition. They set it right in my garage. No issues with shipping or delivery. Set-up took about 30 minutes, putting in oil and some assembly. For my home use, I am sure this will outlast me, so will be the last pressure washer I will ever need to buy. A great machine with lots of cleaning power. Probably overkill for what I need, but I am glad I bought one. With this much cleaning power, it gets the job done very quickly. I am very pleased with this machine. Rated 5 out of 5 by BGBVCBC from Excellent I have had electric pressure washers before but this is the first gas model I bought. I have used it several times and I am very pleased. It is made with top quality components (the Honda engine is great and the AR pump is great) on a very solid and compact frame. I was a bit concerned about the run-flat hard tires, but they work great also. It is a very heavy unit, but it rolls around easily, even through the crushed rocks on one side of our house. I am not sure what their ‘anti-vibration’ system is, but it seems to work. The engine runs very smooth, the machine does not vibrate much, and the unit does not “walk around” or move at all when in use (as others have complained about gas pressure washers). You can get the same engine and pump on other brands for a bit less money, but I bought this one because I like the compact frame which takes up less space for storage. It is very compact. The pump is rated by it’s manufacturer, AR, for max 4000 psi, but it seems they cranked down the unloader spring to get it up to 4200. I backed the unloader off a bit as it seemed to knock hard when I turned the gun off. A minor point, but I could not get the detergent dispenser to work as instructed. It worked fine with the machine shut off, just running the garden hose pressure through it. Lots of detergent came through. But with the machine running and using the detergent spray tip as instructed, no detergent would come through. I generally do not use detergent anyway (I have never been able to tell it helps at all - seems a waste of time to me) but if I do, will have to apply it first before starting the machine. I sent a question in to Powerplay Customer Service from their website almost a month ago and never got a response. So, based on my one-time attempt at customer service from the manufacturer, it seems it does not exist. But it is such a great machine I am not worried about it. I bought it online, but it was shipped directly from the manufacturer to my home. Shipped almost immediately, came on a wooden pallet, upright in it’s box, and in mint condition. No issues with shipping or delivery. Set-up took about 30 minutes, putting in oil and some assembly. For my home use, I am sure this will outlast me, so will be the last pressure washer I will ever need to buy. A great machine with lots of cleaning power. Probably overkill for what I need, but I am glad I bought one. With this much cleaning power, it gets the job done very quickly. I am very pleased with this machine. Why does the description state that this machine has an Annovi-Reverberi pump but it is clearly shown with a CAT pump? Update the picture!